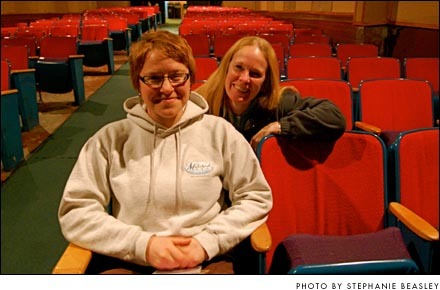 Filmmaker and villager Vanessa Query, left, has organized a festival of original short films that will be shown at the Little Art Theatre at 2 p.m. on Sunday, Feb. 21. She is shown with Little Art -Executive Director Jenny Cowperthwaite-Ruka, who is enthusiastic about providing a venue for independent filmmakers. After she graduated with a theater degree from Antioch College in 2006, Vanessa Query for the next two years lived what she considered the good life in her hometown of Providence, R.I. She had a comfortable salary, her own apartment and bought groceries at Whole Foods. And yet, she felt that something was missing. So Query moved back and became the events coordinator at the Emporium, a previous employer. A few weeks later she answered a Yellow Springs News advertisement for a graphic artist and was hired quickly thereafter. Along with those two jobs, she now also works as a projectionist at Little Art Theatre. While all these jobs keep her busy, Query has nonetheless taken on a huge project. She organized Yellow Springs’ first Short Film Festival, which kicks off at 2 p.m. on Sunday, Feb. 21 at the Little Art, with a repeat showing of the films on Saturday, Feb. 27. The deadline for festival submissions is Jan. 22. The entrance fee is $10 and all films must have been shot in Greene, Montgomery, Clark, Madison, Fayette, Clinton or Warren counties. Having a short film festival at the Little Art sounded exciting to Executive Director Jenny Cowperthwaite-Ruka. Since the theater became a nonprofit organization last October, part of its mission has been to add programming outside of the weekly film showings. Query is part of Little Art’s new programming committee that is trying to spearhead such events. Cowperthwaite-Ruka said that the theater was financially unable to invest any advertisement dollars into the venture, but that has not impeded Query. Over the last few months she sent press releases to area newspapers and created a Facebook page for the festival. She received more than a dozen submissions by the festival’s early deadline of Jan. 8. Brainstorming ideas and quickly executing them seems to come naturally to the 28-year-old. Last winter, she and friend Lee Johnson traveled to Muncie, Ind. to watch a production of Jesus Christ Superstar. Inspired by the artistry behind the large stage production, Query came up with an idea on the drive back home: she would direct a short film. Although she had focused on producing, writing and directing stage productions while at Antioch, she also found herself greatly interested in film. Five years ago, she wrote her first screenplay based on a short story by Irish author Mike McCormack. Query began shooting the film, “Love Conquers All,” in Yellow Springs last June with sound equipment on loan and a used a high-definition camera that she bought from a friend. The dark comedy drama stars Johnson and other local actors. Query received a $200 grant from the Yellow Springs Arts Council to shoot the film, which was part of the “Summer in the Springs” art program. In August, she screened the then work-in-progress at the Emporium, but said that people who were unable to make that presentation kept asking if she would do another at the Little Art, which she was reluctant to do. “Love Conquers All” may be screenedat the festival, but Query said that she did not try to build the event around herself. Rather, she sees the festival as a platform for all local independent filmmakers who, like herself, often find it difficult to secure venues to show their work, particularly if their skills lie somewhere between the student and professional level. In fact, she plans to schedule a test-screening segment before the festival for unfinished projects. Those test screenings will be followed by 15–20 minute feedback -sessions. Query’s goal of promoting local talent and interests is in sync with Cowperthwaite-Ruka, who hopes that the festival will inspire others to hold events at the theater. In terms of Query’s future use of the Little Art, she said that she is open to the idea of organizing another Short Film Festival next year if this one proves to be successful. But, of course, she does not like to plan that far in advance. For now, she’s content working her multiple jobs and nurturing her burgeoning film career in her spare time.